How could the notions of demarcation and difference be reconstituted in a distant environment? Which models can identity be led back to? And which images, spaces and symbols will the artists' fall back to in order to reinvent themselves in a new context? The intricate journey, considered as a productive artist's network, brings up for discussion personal models of continuity and identity in demarcation to a concept of a geographically or nationally derived origin. In the experimental assembly Berlin-Colombia a concrete place faces an imaginary place. From this juxtaposition, moments of void might come about, thus, inspiring a new adjustment to the systems of reference. We - the working group of the NGBK - are interested in individually valid spaces and life situations of people and their personal definitions and demarcation. 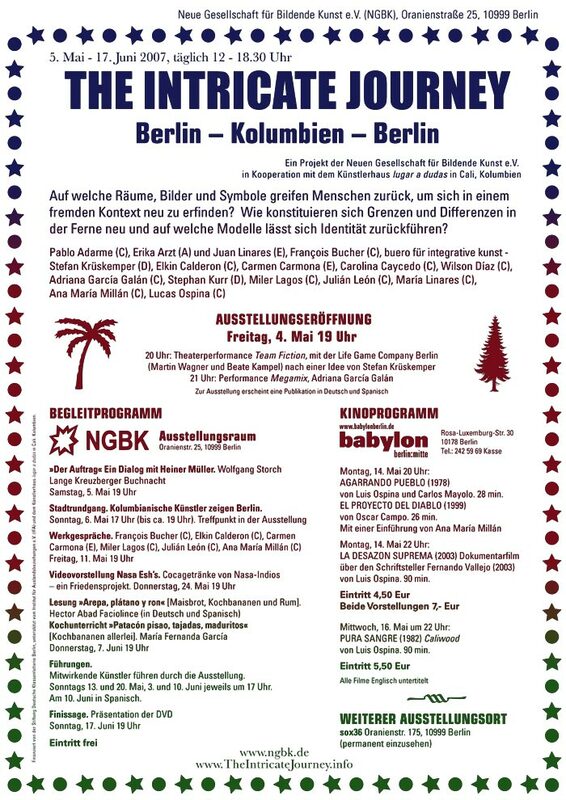 The first travelers are five Colombian artists invited to realize a project in Berlin. Each of these artists represents through his/her methods of work a personal strategy concerning the issue. The strategies stretch from an attempt to dissolve artistic and social limits to the precise manifestation and negotiation of such limits. During the visit in January 2007 the first artistic projects were realized. Alongside there were work presentation and public debates taking place in the Project space of the German artists federation. In conjunction, the window display gallery sox36 was used to display public statements. Following the first visit of the Colombians in Berlin the artists living in Berlin traveled to Colombia in February 2007, staying in the self-administered artist space lugar a dudas in Cali. The stay corresponded with the programming and work procedure of the preceded part in Berlin. The process of work and reflection of the travelers generated suggestions for a last third group, who are invited to Berlin in order to conclude the journey. The exhibition The Intricate Journey takes place from May 5 to June 17, 2007 in the spaces of the NGBK (Neue Gesellschaft fuer Bildende Kunst) and presents the reactions to the journeys and stays as open process. The concept of the exhibition reflects the process by which it was derived, namely by an open productive network through which artists' ideas, strategies and interactions have been discussed and realized. Erika Arzt and Juan Linares, Stefan Krüskemper, Stephan Kurr, Maria Linares. The intricate journey is a working group of the NGBK.